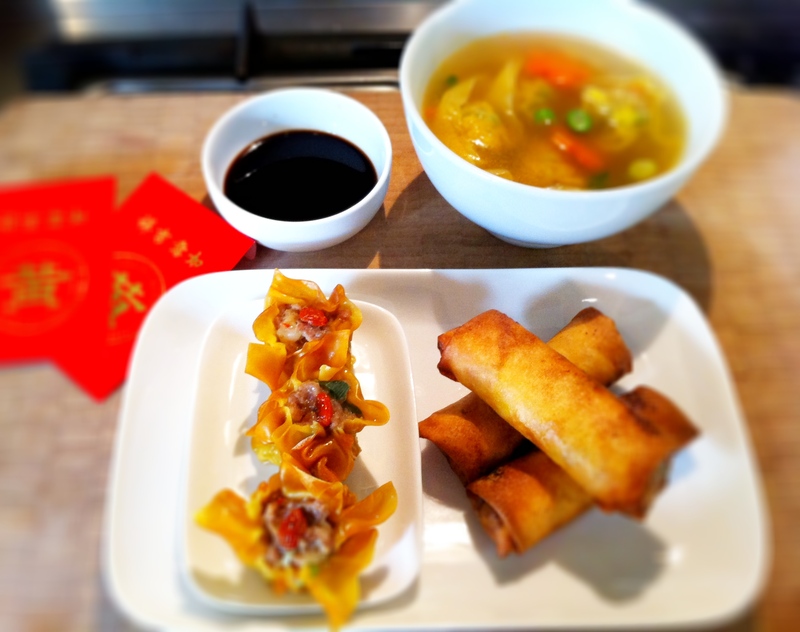 Put your wanton wrappers to one side and in a large bowl, mix all of your ingredients together. When thoroughly combined, divide the mixture into half, placing one half in another bowl. To make the shui mai, place roughly about 2 teaspoons of filling into the centre of a wanton wrapper. Gather the sides up (leaving the centre open, and roughly mold the wrappers around the mixture into a squarish shape. Top each dumpling with a goji berry (you can also substitute goji berries with some red salmon or sturgeon roe). Place in a steamer and steam for 6-8 minutes. First make up 4 cups of your favourite stock and add some sliced carrots to your stock. From half of the pork and prawn mixture that you’ve retained, add the ½ cup of finely chopped spring greens. Mix well and begin wrapping the dumplings, again using about 2 teaspoons for mixture for every dumpling. If you can’t be bothered learning to wrap dumplings, you can just make a ball and twist them to form round dumplings too. To cook the dumplings, drop them into your boiling stock – they’ll only take a couple of minutes to float to the surface and once they float, they’re cooked. I also have a different mix of ingredients for dumplings which you can find here. In a frying pan, brown your pork mince in the vegetable oil. When your meat is browned, add the ginger and pour in your shao xing. Once its burned off, add your soy sauce and lots of white pepper. Turn the heat off, and stir in your grated carrots and cabbage. Mix well. There should be minimal liquid left in the pan and the residual heat from the meat is all you need to lightly cook your grated carrots and cabbage. Use about 1½ to 2 tablespoons of pork/veg mixture for each spring roll. Fry each spring roll for a few minutes on each side until golden brown. Drain on paper towels and serve with a sweet chilli sauce or dipping sauce of your choice.